Winter has been a stingy beast. She promised books, blankets, and steaming mugs of cocoa, but so far all she has delivered is a six-week long flu. So my winter has felt mostly like a cycle of working, sniffling, coughing, sleeping, headaches, working. But in between, a few bookish snatches. And – joy of joys – I spent last night and this morning entirely at home, doing nothing but catching up with family, sleeping, eating, and reading. Because I had friends who had already read this one and were all unimpressed, I went into it with very low expectations. Then, as often happens, my expectations were so low that they were exceeded, and at first I had a lot of fun reading this retelling of a classic Austen tale. But about one third of the way through the book, things began to drag. What had seemed fresh and funny at the beginning simply didn't develop into anything more. The characters felt one-dimensional and boring. There was little to bring sparkle to the story. And worst of all, Emma -- already a challenging character, but with enough wit and warmth to get her by in the original Austen -- is frankly unlikeable in this story. She is selfish, entitled, narrow-minded, judgmental, and incredibly idle. Even her kindness is an act of condescension. The original Emma got herself into strife by being too interested in others' affairs. McCall Smith's Emma isn't really interested in... anything. And this aspect of her character doesn't change throughout the story. In fact, by the end of the book, the vibe was still an introductory one, as if the pace hadn't quite picked up from the opening scene-setting. The conclusion felt hurried and unsatisfactory, a hasty declaration without any evidence of a genuine relationship behind it. What's more, there were some odd moments of sexual confusion for Emma that lent nothing to the story and, in fact, felt like a tacky attempt on the author's part to use the briefest of references to sexual diversity as a trite way to be relevant or contemporary (while still sounding quite the opposite). I like you, Alexander McCall Smith, but I did not like this book. At all. I only recently realised that this version of Emma is one book of the four-book Austen project, which includes other contemporary reimaginings of Austen stories by Val McDermid, Joanna Trollope, and Curtis Sittenfeld. I’ve been seeing Sittenfeld’s Eligible (a Pride and Prejudice story) around bookstagram a lot lately, and am keen to give it a try. But I have to say that this version of Emma left me a little less enthusiastic about exploring an Austen retelling. The book I finished this morning, on the other hand, left me far more satisfied. The Island Will Sink is a debut novel from Australian author Briohny Doyle, and also represents literary mag The Lifted Brow’s first foray into book publishing. The Island Will Sink is out next month and I feel it will meet with a wonderful reception. Why, exactly? It’s hard to put into words. The Island Will Sink is at once intelligent, challenging, and yet accessible. The story is beautifully-paced, unfolding with a process that feels both literary and cinematic, filmic and immersive in a way that compellingly mirrors the story – that of a filmmaker who creates immersive cinema. Max Galleon processes the world through the language of film, and it is through this language that we meet with Max’s world, a near-future landscape of a culture bent on obliterating its environmental footprint and concerned with optimising the physical and mental health and wellbeing of its inhabitants. Enhanced surrounds provide personally-tailored feeds for information and entertainment, virtual reality is the standard plaything of pre-teens, and individual monitoring systems report on, archive, and even edit personal experience and memory. Everything is within reach – and at the same time, nothing is. Max is a man in crisis mode, obsessed with his own amnesia, neglectful of his family, and stuck in creative block as he plans his next blockbuster disaster film, the latest in a long line of films to plunge their audiences into a simulation of total annihilation. 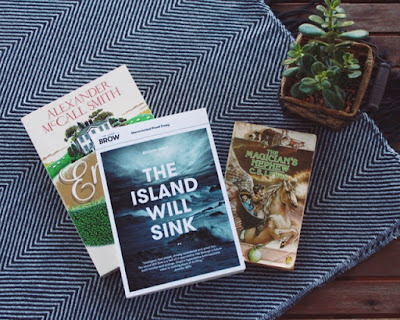 The timing of Max’s film project coincides with the accelerated sinking of Pitcairn Island into the Pacific Ocean, an environmental disaster which would signal the beginning of a new age. The story builds with a sense of quiet foreboding, a subtle suspense heightened by the fact that Max, in his state of confusion, is an unreliable narrator. In fact, his whole world is unreliable, because when memories can be erased and rewritten, reality is a constantly shifting thing. The gaps in Max’s knowledge become gaps in the reader’s knowledge as the threads of narrative come apart and then together again. The story plays out with a cool sterility reminiscent of films like Equilibrium, a grand sense of opera as in Tree of Life, and deliciously-balanced surrealism (think Inception). Beautifully written and even darkly humorous in places, it puts speculative fiction, often considered the domain of a specific readership, within the reach of anyone. I want to read it again and pull together the threads I might’ve missed, and I can’t wait to read others’ reviews of this one as it meets with audiences. A very impressive debut. Finally, last night I began CS Lewis’ The Magician’s Nephew, which I’m buddy-reading with my sister Andrea. It’s her first time reading and my first-time-in-a-long-time after devouring it many times in childhood. Already the story is rushing back to mind, along with those childhood feelings of wonder and fear. It’ll be so much fun to read and chat about this with my sister as we go.